By the way, Walter still stinks… badly! 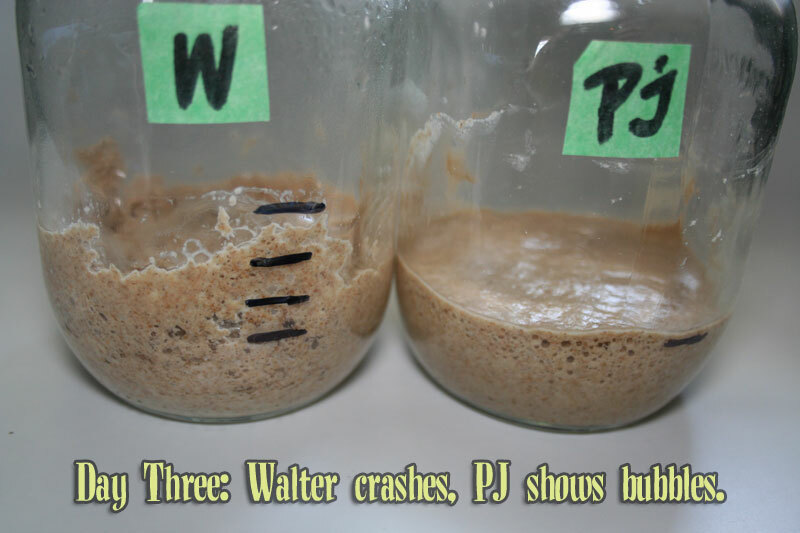 PJ’s slight bubble production indicates he may be inching (millimetering?) into phase 3 already: developing more acid-tolerant bacteria. 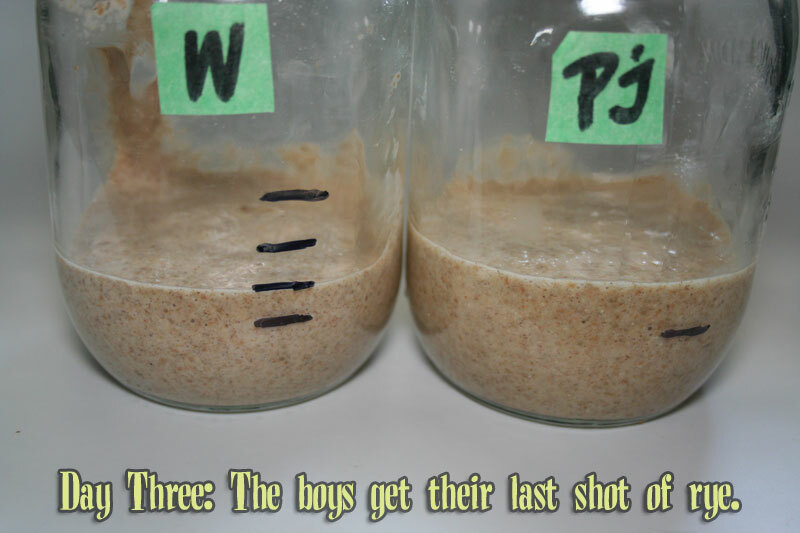 After giving them their final (we assume) shot of rye – and pineapple juice to PJ – they get a stir and settle in for the rest of the day. Tomorrow, they graduate to UAP and water. Like grown up boys! Wally is sleeping (and still stinking) but PJ has decided to get active. That’s about a 50% expansion there from the last feed level. The aroma is still primarily of pineapple and I expect this masks any other aromas that may actually be present, like slight yeasty or sour smells. Once we begin to discard and switch to UAP (Unbleached All Purpose) and switch off juice to water, we’ll be able to discern what we’ve got going on here a lot easier. Likewise, the fresh UAP and water will help clear out the stinky bacteria from Wally’s jar. Wally at this point is probably just beginning the stage PJ has been at for the last three days (thanks to the acid in the pineapple juice) so we may not see similar activity from him for a few days more. Hi there! I’m following along here and am in the evening of day 3 (feeding in the morning). So far I am seeing no activity at all. Should I continue with day/step 4 or should I keep adding whole wheat flour and pineapple juice until I see the kind of activity shown here? I’ve worked with sourdough before, but never managed to make my own starter before and I would REALLY like to! Move to Day 4 where you switch off whole grain and pineapple and use all purpose and water. You’ll see the first line includes “and once daily until it starts to expand and smell yeasty”. So day four is where you “repeat as needed”. You don’t need any more pineapple juice, the pH is low enough, and you have set up enough good yeasties to get things going. They just need a bit more time to wake up. Don’t forget the most important ingredient is… patience. It will get there, slow and steady. OK – Here is the skinny on Mina! Feed her the last PJ and rye at 9:17 am and 10 hours later she is just 50 % of her formal self. Yep – temps have had an effect on her expansion (sp). I’m looking forward to 12/11/10 to see what she will do. Indeed, temps have a very definite effect on the activity of a starter. If you can, do try to find a warmer spot for the starter to spend the day in. It doesn’t have to live in the kitchen either. If it’s a few degrees warmer next to the computer or TV which are on all day (even if the screen is off), then that’s where it could go. Or on top of the fridge (heat coming up the back from the coils) or in an oven with just the light on – but check it isn’t TOO hot first. Some ovens are well sealed and one light can get the temps quite high (i.e. over 100ºF) after some time. So turn the light on with a thermometer inside and check the temp after one hour and two hours. You may need to crack open the door with a rolled towel to adjust the temp. Even next to a table lamp that can be on all the time will be a few degrees warmer. You want it mid 70’s to mid 80’s ºF, definitely nothing past the 90’s though. And if you do put it in the oven, tape a note on the oven knob so no one forgets to take it out before turning the oven on. The oven light creates an environment that is too hot – in the mid 90’s. Thank you for other possible options to warm her up a little bit. Yes, the cooler temperature will slow things down some so you’re looking at adding a few extra days. 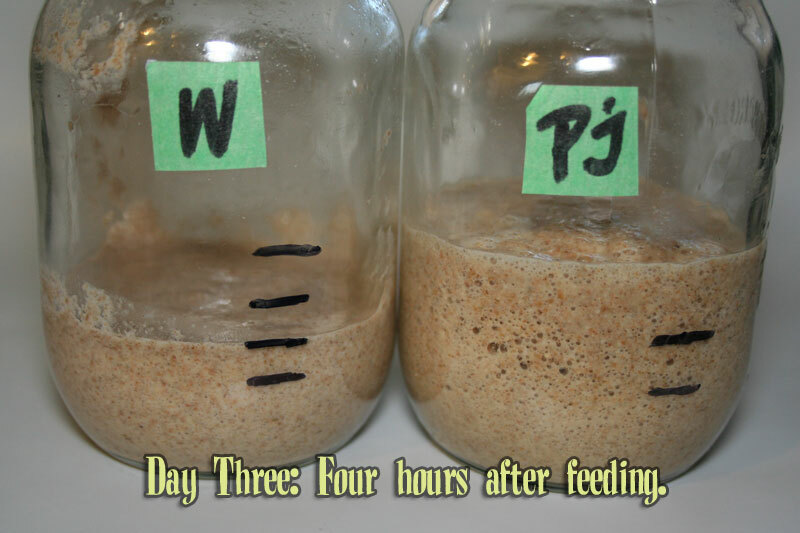 Once you’ve passed the “stinky” stage, your starter will begin to develop the yeasties you are looking for, but this does take a bit of time. The thing to keep in mind is that these critters will take whatever time they need to get where they need to. But they will eventually get there. As in everything else bread, patience is a highly important ingredient in anything you make, including the starter. Keep it (covered of course) near the back of the fridge so it catches the warmth of the coils in back and that should help get things moving soon enough.